Newly-elected Canadian Prime Minister Justin Trudeau, who ended the near-decade Conservative rule in the country when his Liberal Party romped to victory in Monday’s federal election, has got down to business. On Tuesday, Trudeau called up United States President Barack Obama to convey that he would make good on a campaign promise to withdraw Canada’s jets from the United States-led bombing campaign against the Islamic State in Iraq and Syria. Canada had joined the air assault in Iraq in 2014 against the IS militia. 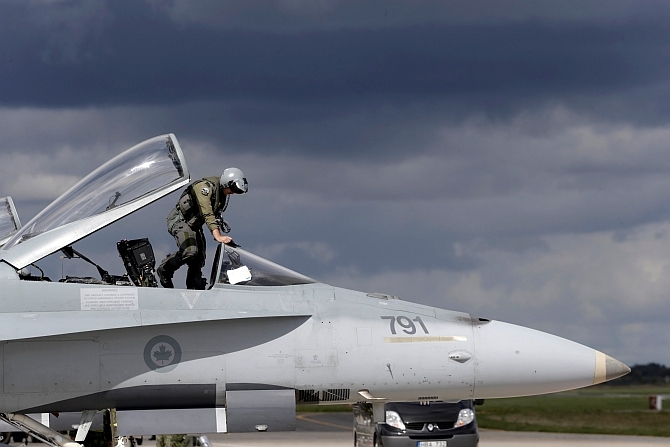 Currently, it has seven CF-18 fighter jets as well as two Aurora surveillance aircraft and a handful of strategic lift and refuelling planes committed to the coalition air campaign. While reducing Canada’s combat role in the anti-IS campaign, Trudeau has promised to send extra military trainers to help develop Iraqi security forces and to take in more Syrian refugees. “I committed that we would continue to engage in a responsible way that understands how Canada has a role to play in the fight against IS,” Trudeau told Obama over the phone. Trudeau also sought to reach out to President Obama, hinting at plugging gaps in US-Canadian relations vis-à-vis Keystone XL pipeline. Trudeau’s predecessor Stephen Harper has disagreed sharply with Obama over the proposed Keystone XL pipeline, which would transport 830,000 barrels per day of diluted bitumen from Alberta, Canada, to US oil refineries. Proponents of Keystone XL have said it would create thousands of jobs and provide energy security, while environmentalists are concerned that mining the tar sands requires a significant amount of energy and say the project would increase greenhouse gas emissions. Harper said the approval of Keystone was a “no-brainer” and that he wouldn’t “take no for an answer” from Obama -- comments that intensified the controversy over a pipeline that faced opposition from Nebraska ranchers and environmentalists. Obama vetoed legislation earlier this year to approve Keystone XL. While Trudeau also backs the pipeline, he said that his government will seek a “broader relationship with US,” rather than one that “focuses on a single disagreement on a pipeline,” he added. It is unlikely that Trudeau will openly criticise Obama over Keystone like Harper was keen to do. In fact, Trudeau’s Liberal Party is rabidly anti-Keystone.